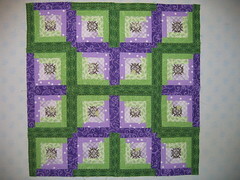 Kristin has now received the little quilt I sent her in the Mini Quilt In A Bag 3 Swap so I can post this picture. Unfortunately I forgot to take a picture of it when it was completed so I will have to be satisfied with this one. I didn't get any sewing done yesterday because I had to take care of my little Lucy (the poodle). She has been rather lethargic and isn't eating or drinking really. I took her to the vet and he couldn't find anything obvious wrong and she isn't vomiting so that is good but she is still lethargic so I will stay home today and keep an eye on her. Since she is sleeping on her pillow on the floor next to the sewing machine I guess I can get some sewing done. Maybe I will get that t-shirt quilt quilted and bound today.